Thousands of trout fingerlings, like this brook trout (Salvelinus fontinalis), are raised and stocked every year by students in classrooms across the Chesapeake Bay Watershed. Photo by Ryan Davis. Trout are excellent ambassadors of forested landscapes. They are widely fished for recreation, economically important, and downright charismatic, especially the stunning native brook trout. 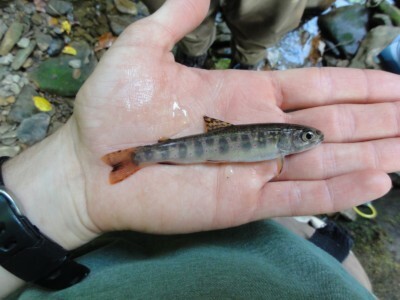 People are proud of their “brookies”, and with a little bit of education quickly become passionate about forest health to provide the clean, cool water for treasured trout populations. Trout Unlimited’s Trout in the Classroom program has excelled at educating and engaging schoolchildren, creating a generation of students that are passionate about coldwater conservation. 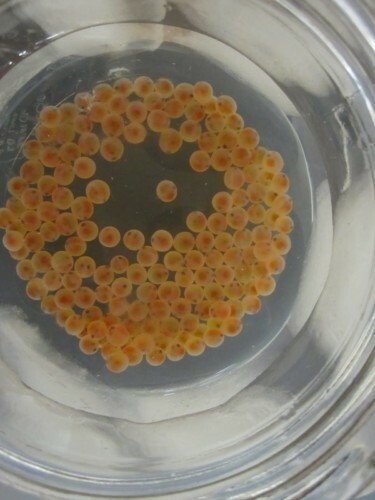 Trout eggs in Mrs. Maruskin’s 6th grade science class at Monocacy Middle School. 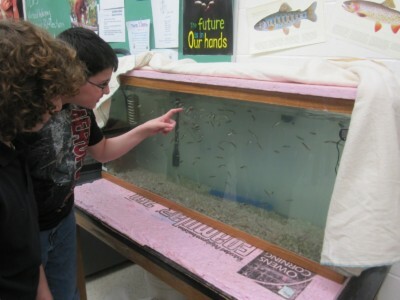 Trout in the Classroom is an educational program where, as its name suggests, students raise trout in their classroom while learning about their ecology and conservation. Participating classes are typically in grades 3-12. Students begin learning and setting up their aquariums when the school year starts, and receive eggs in the fall. They monitor and raise their fish from hatching to the fingerling stage, and release them in approved streams in the spring. The small-scale stocking by students may boost trout populations a bit, but the real results of the program come from fostering a conservation ethic and ecological understanding in students. Before the eggs arrive they learn lessons about watersheds, water quality issues, and how upland land uses impact water, and as the trout grow they cover increasingly complex topics on aquatic ecology. Many teachers also interweave lessons in topics other than biology, from math and social studies to English and technology. An impressive amount of classrooms start blogs to chronicle their trout’s growth, and many correspond with other Trout in the Classroom participants around the country to learn more about the conservation issues and cultures of other places. Every state in the Chesapeake Bay Watershed (plus Washington DC) have Trout in the Classroom programs, with the exception of Delaware, which historically had no trout population. The program works somewhat differently in every state, but there is typically substantial support available for teachers who are interested, no matter where they are. Participating teachers often partner with conservation organizations, like Trout Unlimited chapters or conservation districts, to broaden the curriculum and increase their students’ exposure to local conservation issues. Costs can be substantial between aquarium setup, field trips, and materials, but many Trout Unlimited chapters sponsor schools, and there are grants through some state Trout Unlimited Councils to help teachers get started or continue after their first year. Students monitoring trout fry in Mrs. Maruskin’s 6th grade science class at Monocacy Middle School. The brook trout is the state fish of a majority of the states in the Chesapeake Bay Watershed for a reason. Our vast forest cover provides cool, clean water for this sensitive species and many more. In a time of pinched budgets and packed curricula, Trout in the Classroom is an opportunity for students to learn and grow along with their fish. It is creating the next generation of good stewards, an invaluable investment in the future of our forests and streams. Most state programs require teachers to register in the spring, so now is the time to look into Trout in the Classroom for your local schools! To learn more and find resources in your state, visit http://www.troutintheclassroom.org. For more on fish, forest, and wildlife conservation visit www.forestsforthebay.org or contact Ryan Davis at rdavis@allianceforthebay.org. Ryan is the Alliance's Program Manager for our Chesapeake Forests program. He focuses on forest conservation and restoration within the watershed in Pennsylvania, Maryland, and New York.